HBO recreated NASA's push to land astronauts on the Moon in its 12-part series "From Earth to the Moon." It seems tobe the week of the Moon. Not onlydid NASA unveil its new plan to send humanexplorers to the Moon by 2018, but IMAX released MagnificentDesolation: Walking on the Moon in 3D nationwide today and - since goodthings come in threes - HBO Video released its new DVDbox set From the Earth to the Moon: The Signature Edition. A singlevein runs through all three events - NASA's Apollo-era feat of not only sending24 astronauts to Moon, landing 12 on its surface, and returning them safely toEarth. But it isonly From the Earth to the Moon that covers the broad spectrum of NASA'sentire Apollo effort, from the astronauts and their wives to the Apollo testflights that never left Earth orbit let alone the ground. In 1961,with the Cold War on and the U.S. facing a space race with the then SovietUnion, President John F. Kennedy - perhaps despite his personal views -committedthe nation to land Americans on Moon. The effort culminated with the July 20,1969 Apollo11 Moon landing, and was followed by five more successful landings and onespace crisis. HBO's new Fromthe Earth to the Moon five-disc box set chronicles the Apollo effort - withnods to its progenitor programs Mercuryand Gemini- presented digitally remastered and in a widescreenformat. 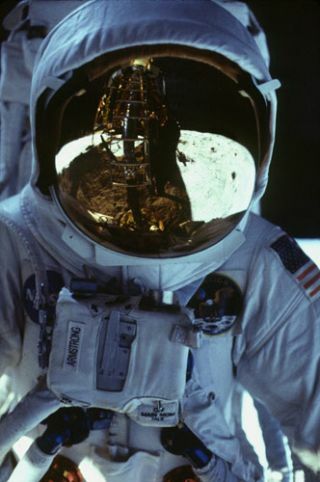 The series is based in part on space writer Andrew Chaikin'sbook A Man on the Moon, with actor Tom Hanks - who portrayed beleagueredApollo 13 commander James Lovell and - serving as the 1998 mini-series'executive producer. Despitetheir episodic format, each of the 12 installments of From the Earth to theMoon feels like a separate film. While some drama has likely beenintroduced for storytelling purposes, there was also inherent drama in NASA'spush to reach the Moon before Kennedy's 1969 deadline. The loss ofastronauts Gus Grissom, Ed White and Roger Chaffee, who perished when a firebroke out inside their Apollo 1 capsule during a routine test, is particularlystrong in the series' second episode given the somewhat recent 2003 Columbiaaccident which killed seven NASA astronauts and grounded the space agency for morethan two years. Collectedin a neat volume, From the Earth to the Moon also include a bonus discof extras with resources designed to expand viewer knowledge about, you guessedit, the Moon. The text ofKennedy's speech calling for a targeted Moon landing space program is included,as are timeline of the U.S. and Russia space race accomplishments, seriestrailers and guides to both prominent astronomers and the objects they study. While acommentary or two would be nice - they are noticeably absent - the box set doescontain entertaining featurettes providing a30-minute behind-the-scenes look at the cast and crew, as well as a window intothe series' special effects. NASA's new visionfor four-astronaut Moon landings and potential six-month lunar missions is nodoubt a lofty plan for human space exploration. But, like Apollo, it is capsuleand lander based, with many of the vital pieces -powerful rockets, docking methods, lunar landers-developed a generation ago. Modern technology, with its smaller, more powerfulcomputers and new materials, will likely add to what was once a proven way toreach the Moon. But Fromthe Earth to the Moon shows how NASA did it first so that hopefully, come2018, the space agency can do it better.